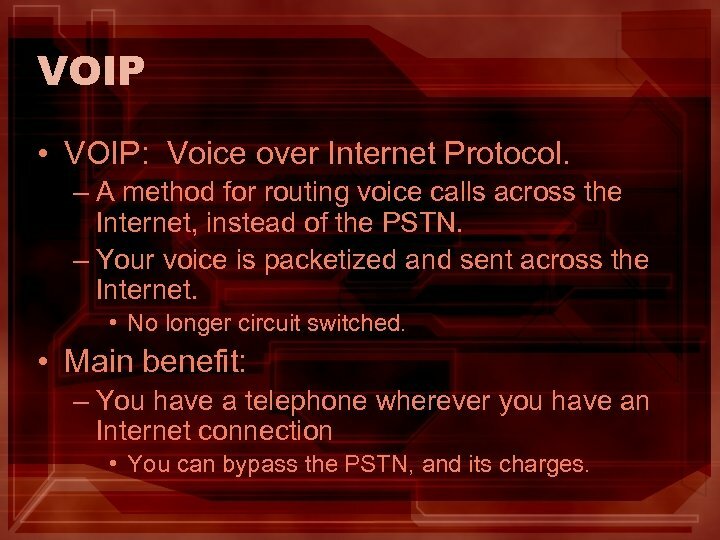 VOIP • VOIP: Voice over Internet Protocol. – A method for routing voice calls across the Internet, instead of the PSTN. – Your voice is packetized and sent across the Internet. • No longer circuit switched. • Main benefit: – You have a telephone wherever you have an Internet connection • You can bypass the PSTN, and its charges. 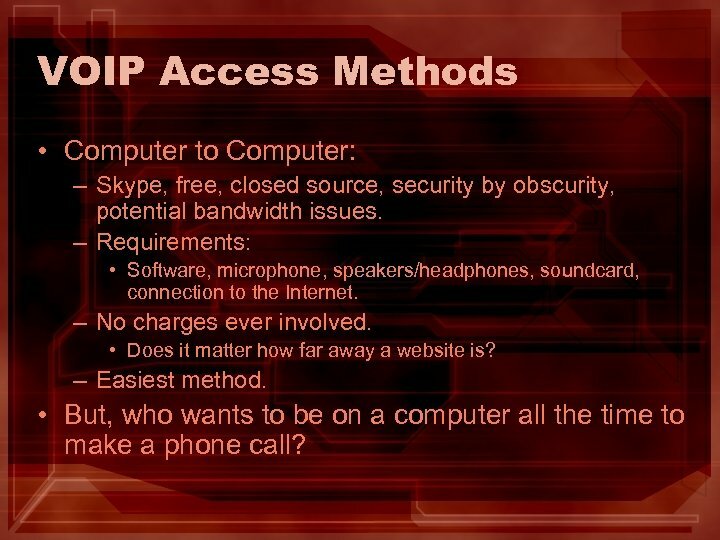 VOIP Access Methods • Computer to Computer: – Skype, free, closed source, security by obscurity, potential bandwidth issues. – Requirements: • Software, microphone, speakers/headphones, soundcard, connection to the Internet. – No charges ever involved. • Does it matter how far away a website is? – Easiest method. • But, who wants to be on a computer all the time to make a phone call? 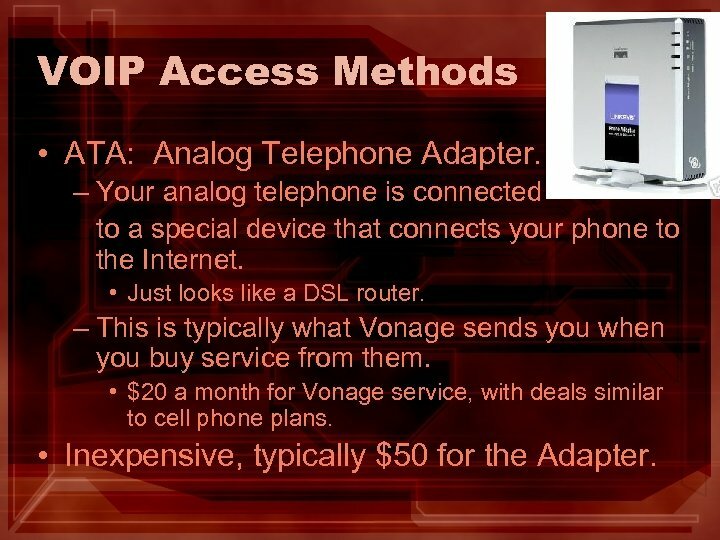 VOIP Access Methods • ATA: Analog Telephone Adapter. – Your analog telephone is connected to a special device that connects your phone to the Internet. • Just looks like a DSL router. – This is typically what Vonage sends you when you buy service from them. • $20 a month for Vonage service, with deals similar to cell phone plans. • Inexpensive, typically $50 for the Adapter. 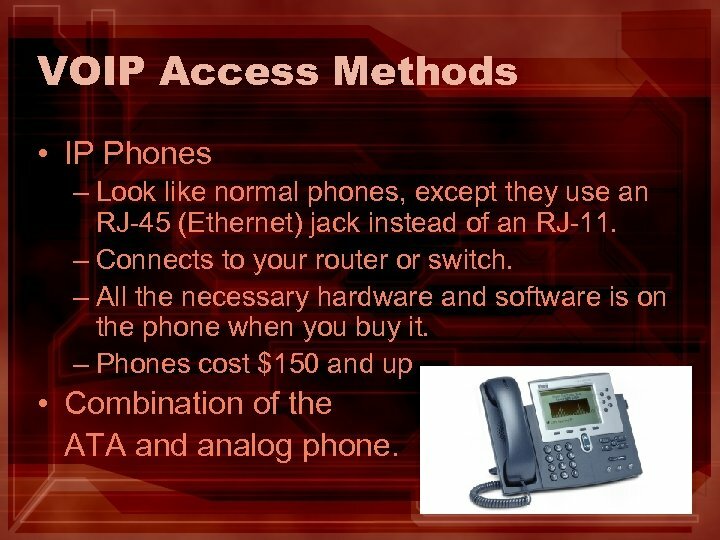 VOIP Access Methods • IP Phones – Look like normal phones, except they use an RJ-45 (Ethernet) jack instead of an RJ-11. – Connects to your router or switch. – All the necessary hardware and software is on the phone when you buy it. – Phones cost $150 and up • Combination of the ATA and analog phone. 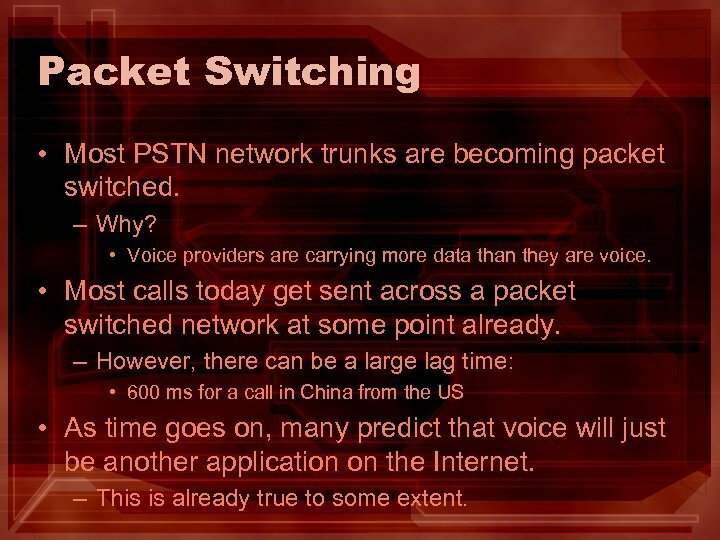 Packet Switching • Most PSTN network trunks are becoming packet switched. – Why? • Voice providers are carrying more data than they are voice. • Most calls today get sent across a packet switched network at some point already. – However, there can be a large lag time: • 600 ms for a call in China from the US • As time goes on, many predict that voice will just be another application on the Internet. – This is already true to some extent. Nokia E 61 • Dual Mode with Wi. 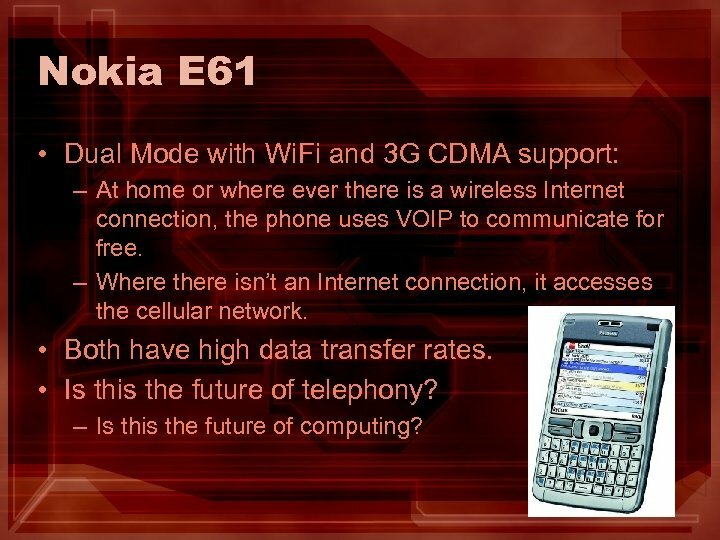 Fi and 3 G CDMA support: – At home or where ever there is a wireless Internet connection, the phone uses VOIP to communicate for free. – Where there isn’t an Internet connection, it accesses the cellular network. • Both have high data transfer rates. • Is this the future of telephony? – Is this the future of computing? 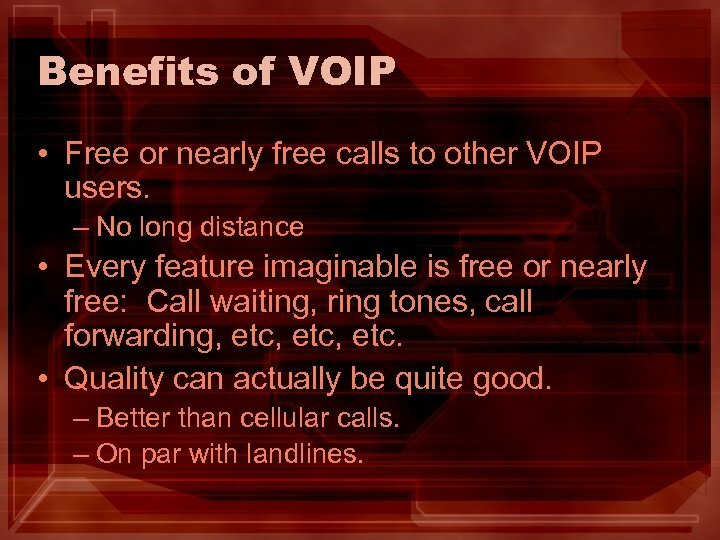 Benefits of VOIP • Free or nearly free calls to other VOIP users. – No long distance • Every feature imaginable is free or nearly free: Call waiting, ring tones, call forwarding, etc, etc. • Quality can actually be quite good. – Better than cellular calls. – On par with landlines. 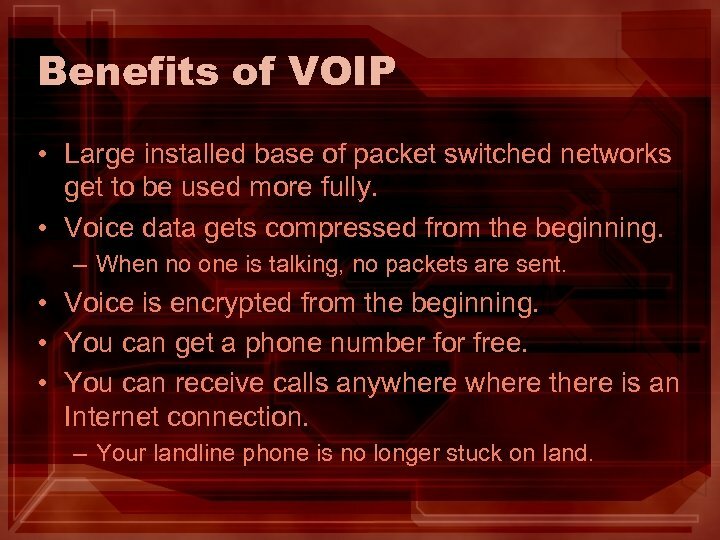 Benefits of VOIP • Large installed base of packet switched networks get to be used more fully. • Voice data gets compressed from the beginning. – When no one is talking, no packets are sent. • Voice is encrypted from the beginning. • You can get a phone number for free. • You can receive calls anywhere there is an Internet connection. – Your landline phone is no longer stuck on land. 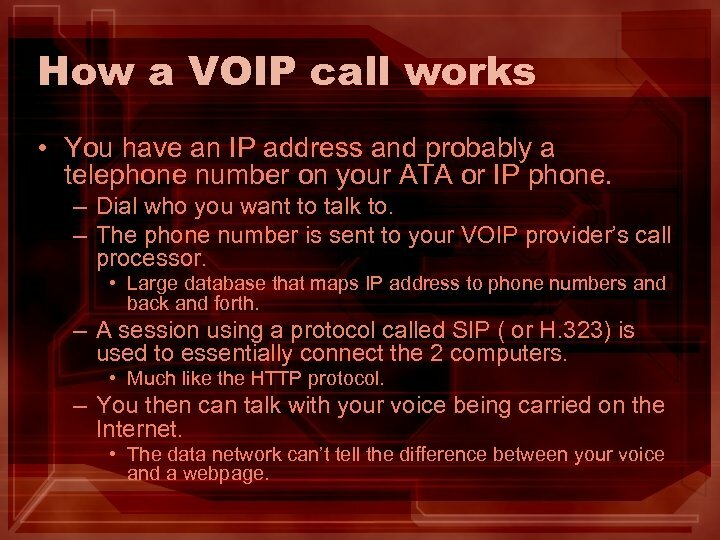 How a VOIP call works • You have an IP address and probably a telephone number on your ATA or IP phone. – Dial who you want to talk to. – The phone number is sent to your VOIP provider’s call processor. • Large database that maps IP address to phone numbers and back and forth. – A session using a protocol called SIP ( or H. 323) is used to essentially connect the 2 computers. • Much like the HTTP protocol. – You then can talk with your voice being carried on the Internet. • The data network can’t tell the difference between your voice and a webpage. 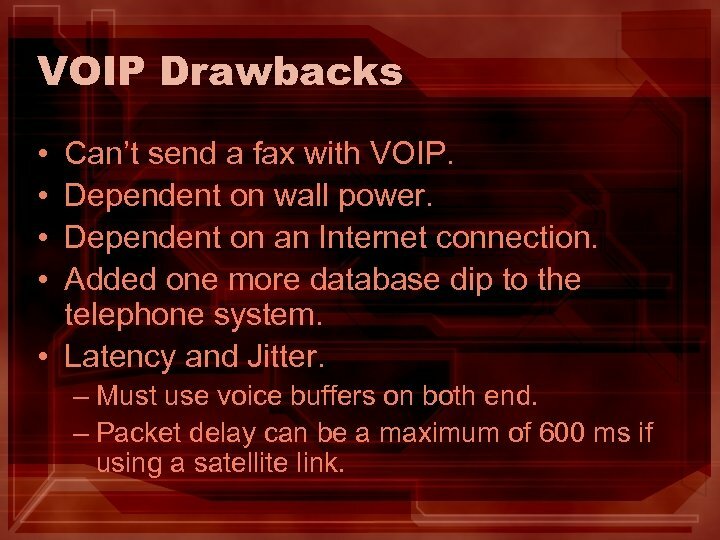 VOIP Drawbacks • • Can’t send a fax with VOIP. Dependent on wall power. Dependent on an Internet connection. Added one more database dip to the telephone system. • Latency and Jitter. – Must use voice buffers on both end. – Packet delay can be a maximum of 600 ms if using a satellite link. 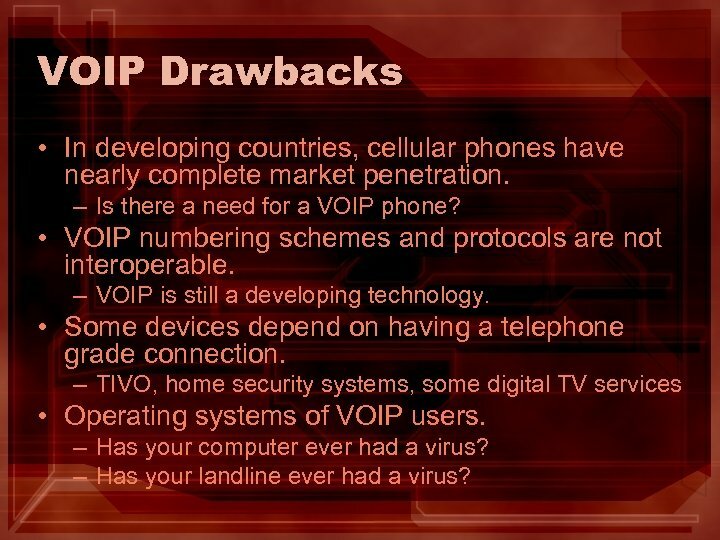 VOIP Drawbacks • In developing countries, cellular phones have nearly complete market penetration. – Is there a need for a VOIP phone? • VOIP numbering schemes and protocols are not interoperable. 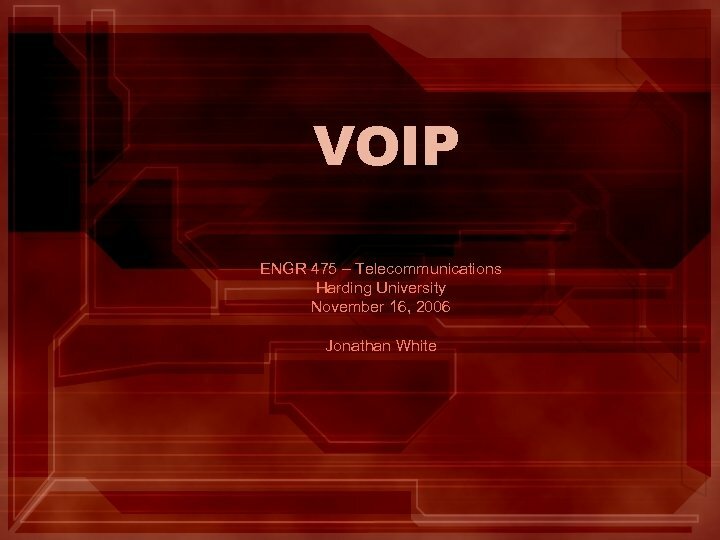 – VOIP is still a developing technology. • Some devices depend on having a telephone grade connection. – TIVO, home security systems, some digital TV services • Operating systems of VOIP users. – Has your computer ever had a virus? 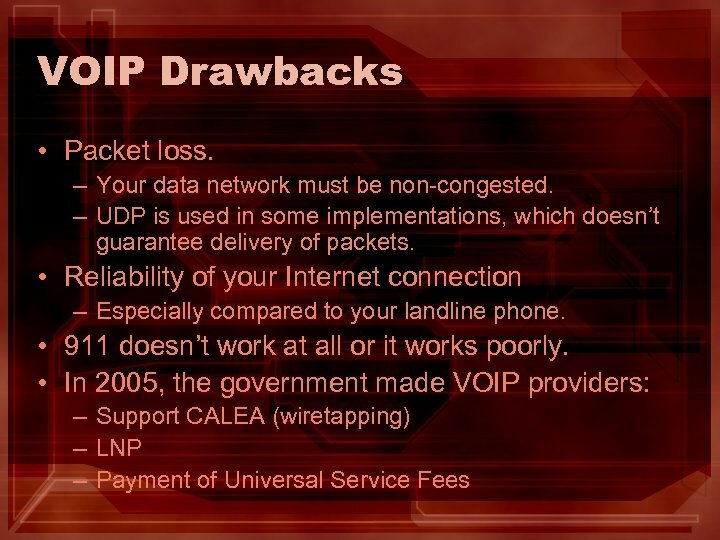 – Has your landline ever had a virus? 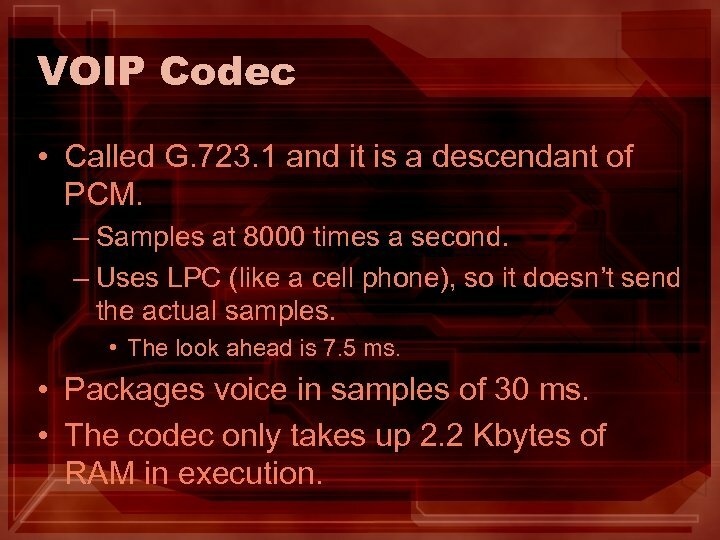 VOIP Codec • Called G. 723. 1 and it is a descendant of PCM. – Samples at 8000 times a second. – Uses LPC (like a cell phone), so it doesn’t send the actual samples. • The look ahead is 7. 5 ms. • Packages voice in samples of 30 ms. • The codec only takes up 2. 2 Kbytes of RAM in execution. 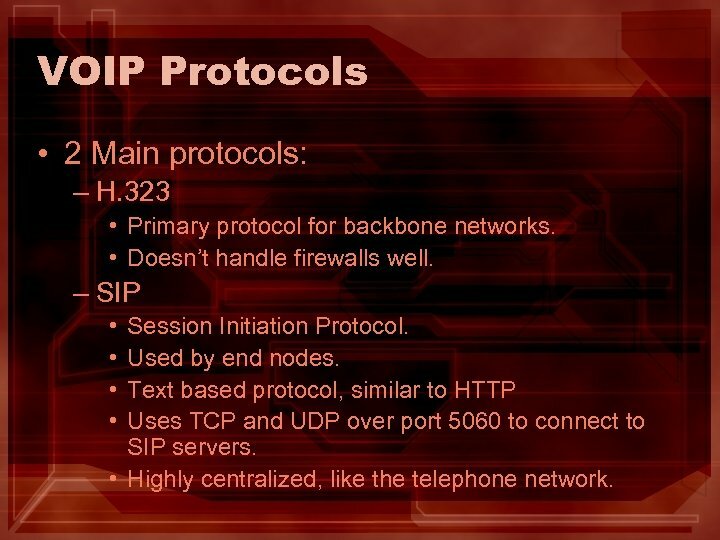 VOIP Protocols • 2 Main protocols: – H. 323 • Primary protocol for backbone networks. • Doesn’t handle firewalls well. 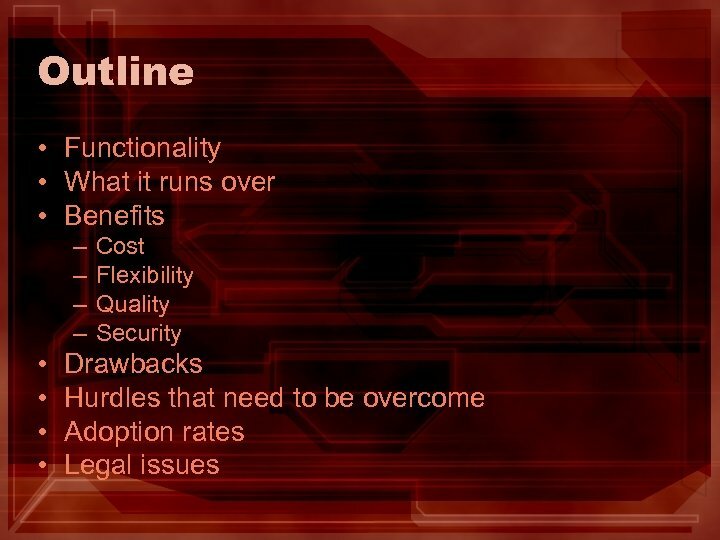 – SIP • • Session Initiation Protocol. Used by end nodes. Text based protocol, similar to HTTP Uses TCP and UDP over port 5060 to connect to SIP servers. • Highly centralized, like the telephone network.